A rapidly changing economy and a new Millennial workforce are putting new pressures and expectations on learning and development (L&D). Organizations are trying to bridge a widening skills gap by investing in L&D programs to help reskill their existing workforce, prepare employees for continued success, and enhance their employment brand–allowing them to attract and retain Millennials. 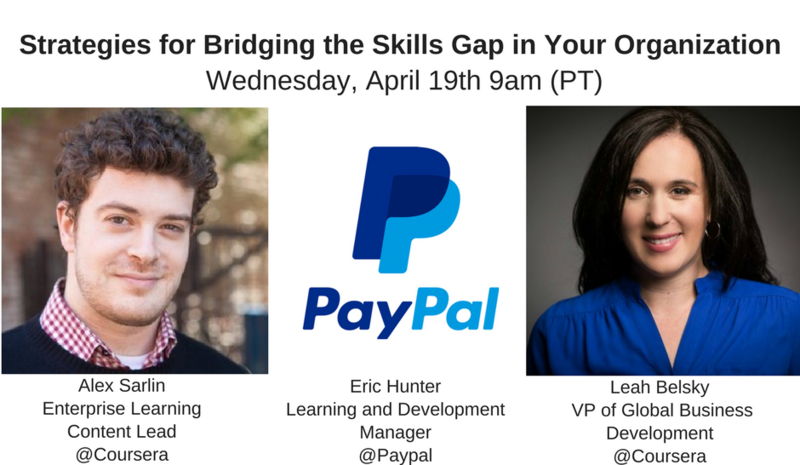 In this webinar, Eric Hunter, Learning and Development Manager at PayPal joins Leah Belsky, VP of Global Business Development and Alex Sarlin, Enterprise Learning Design Lead to discuss the shifts in work and learning, and the challenges and opportunities for L&D leaders in this new landscape. For more information about Coursera for Business, please contact us.